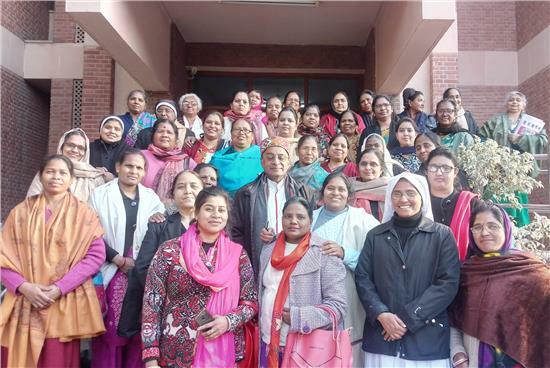 The North Regional Women’s Council Meeting was organized by Sr Babita Kumari Das, MMS, Regional Secretary for CBCI Council for Women, at Yusuf Sadan, Gol- Dak-khana, Delhi from January 19th to 20th 2019. Most Rev. Bishop Ignatius the Bishop of Chandigarh and the Chairperson of the North CCBI Women Commission, Sr. Talisha SD the National Secretary for CBCI Council for Women were present for the occasion. Most Rev. Anil J.T. Couto the Archbishop of Delhi also came and gave the words of encouragement and assured his support and cooperation for the women. He shared that this is the only commission, which works together with all the Dioceses - Latin Syro-Malabar and Syro - Malankara. This is unique and beautiful. He appreciated for this effort and wished to work for the kingdom of God in bringing peace, love and joy to the world. The women from all the six Dioceses-Chandigarh, Jammu, Jalandhar, Gurgaon, Faridabad and Delhi took part in this event. Most Rev. Bishop Ignatius Mascarenhas gave inaugural message emphasising on the Word of God and the call we have to live. He also mentioned that all the topics were relevant and have relevancy with the Bible. Sr. Asha Paul, the resource person for the Constitution explained to the audience that all that is not in the constitution is taking place in our society but what is there is not being given to the citizen. Therefore, there is a need to raise voice whenever the constitutional rights of the individual is denied or is at stake. The CBCI Dalit policy was presented by Sr. Robancy, the Program Co-ordinator of the CBCI Office for SC/BC. She shared few heart touching true stories of a girl and a woman who were being discriminated in schools because they were Dalits. The sad part to know was that after 71 years of Independence and introduction of the CBCI policy still there is caste system practiced in the Catholic Church, as there is a separate cemetery for the Dalits and the high caste. .
Sr. Talisha began her presentation of gender sensitization and CBCI Guidelines on sexual harassment at workplace by explaining to the members the structure and activities of the National – Regional and Diocesan Women Council/Commission. She emphasised that we need to see in each our Diocese if the Complaints Committee, which is mandatory as per the Government Act 2013, is made and see for the formation of the same. After the tea break the group was divided into Diocesan wise to prepare Action plan for the coming Year and each Diocese presented it. In the evening session, Sr. Sneha Gill, the Member of the Delhi Minority Commission, shared about the Minority Rights conferred to all the Citizens and in particularly to the Christian minorities. She also explained the various Delhi Government Schemes available for the minorities. The second day began with the explanation and clarifications on minority rights followed by Mr. Devasia’s presentation on The Joy of Love (Amoris Laetitia). He explained in depth the role of family in building the Church and oneself being an example for one another in the family. The program concluded by 12.30pm. It was a successful event which was conducted after a couple of years’ gap.